执行@RequestMapping方法抛出异常后，Spring框架 try-catch的方法捕获异常, 正常逻辑发不发生异常都会走processDispatchResult流程 ，区别在于异常的参数是否为null . 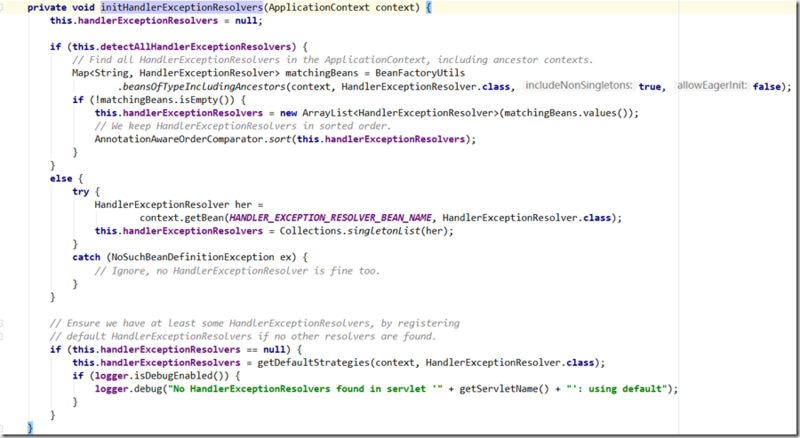 记录<mvc:annotation-driven/>注册的第一个 HandlerExceptionResolver : ExceptionHandlerExceptionResolver, 继承关系如下面所示. AbstractHandlerExceptionResolver 和 AbstractHandlerMethodExceptionResolver名字看起来非常相似. 这里AbstractHandlerExceptionResolver 的shouldApplyTo都返回 true, logException用来记录日志、prepareResponse方法用来设置response的Cache-Control. 异常处理方法就位于doResolveException. Spring初始化的时候并没有额外配置 , 所以mappedHandlers和mappedHandlerClasses都为null, 可以在这块扩展进行筛选 ，AbstractHandlerExceptionResolver提供了 setMappedHandlerClasses 、setMappedHandlers用于扩展. 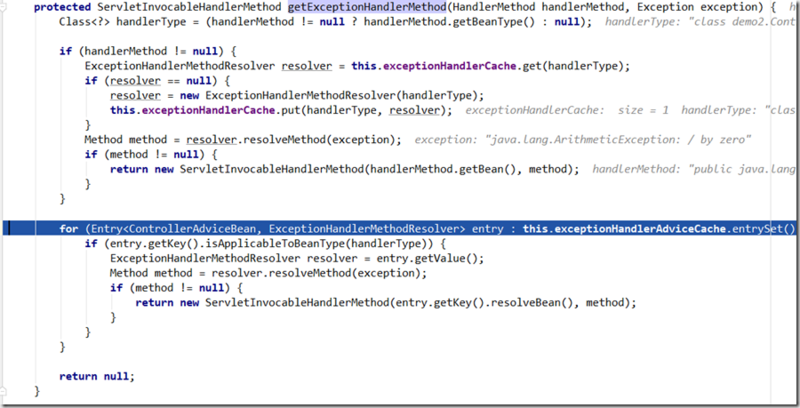 @ExceptionHandler的方法入参支持：Exception ；SessionAttribute 、 RequestAttribute注解 ； HttpServletRequest 、HttpServletResponse、HttpSession. 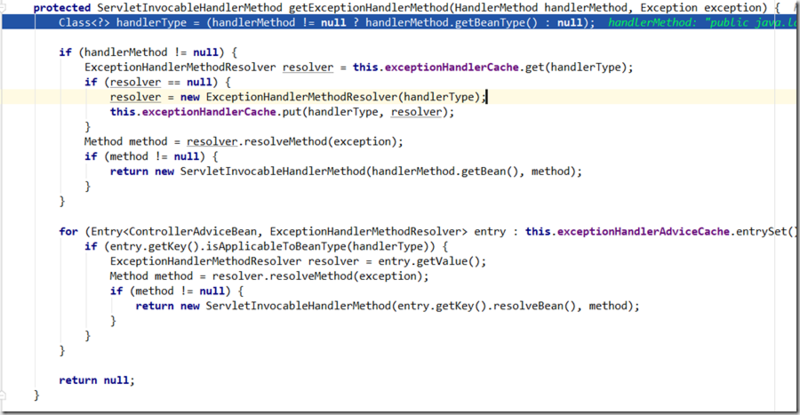 handlerType指代Controller的class属性，尝试从缓存A exceptionHandlerCache 中根据controller的class 查找ExceptionHandlerMethodResolver； 缓存A之前没存储过Controller的class ，所以新建一个ExceptionHandlerMethodResolver 加入缓存中. ExceptionHandlerMethodResolver 的初始化工作一定做了某些工作! 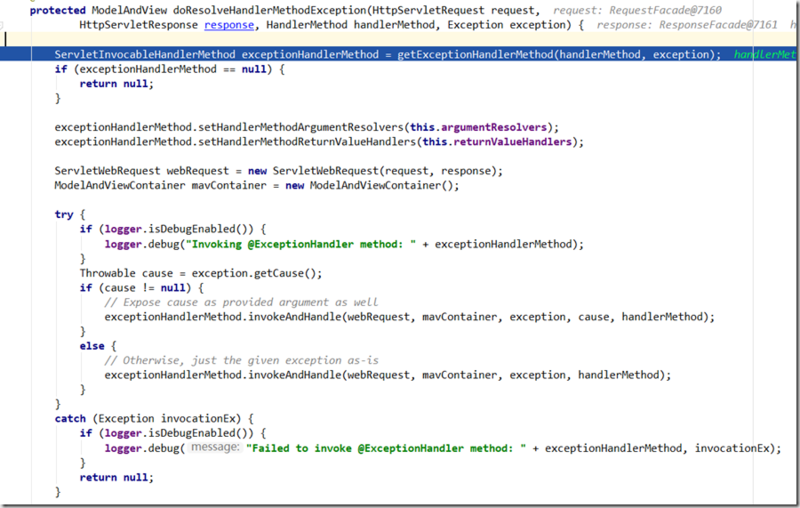 resolveMethod方法：根据异常对象让 ExceptionHandlerMethodResolver 解析得到 method ， 匹配到异常处理方法 就直接封装成对象 ServletInvocableHandlerMethod ； 就不会再去走@ControllerAdvice里的异常处理器了. 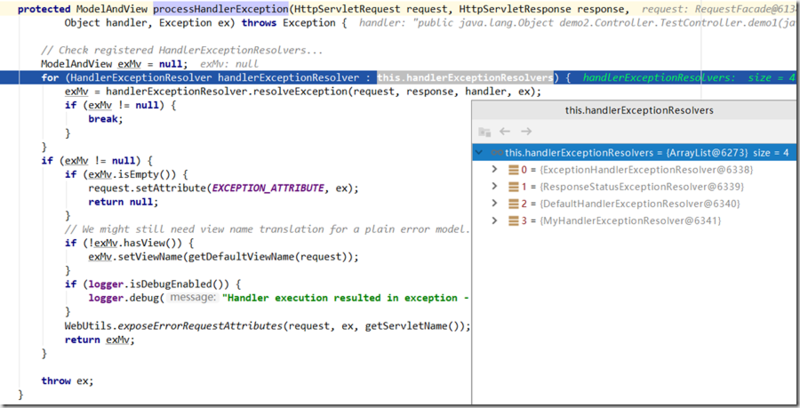 这里说明了，ExceptionHandlerMethodResolver 初始化的时候完成存储 @ExceptionHandler. 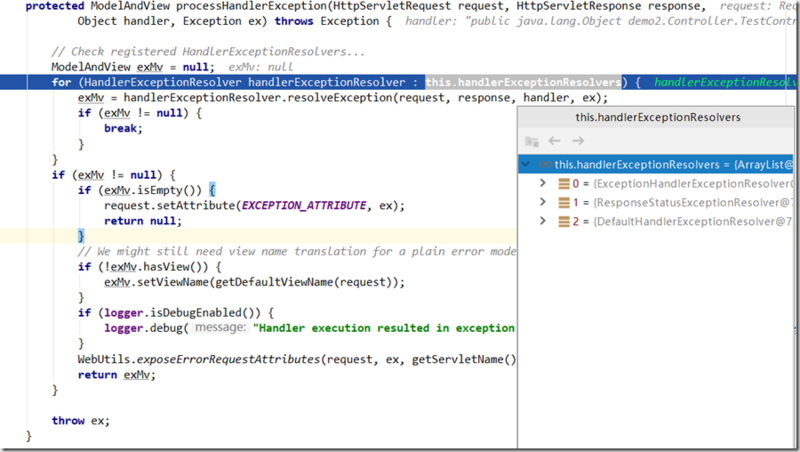 handlerType为传入的Controller的class属性，通过EXCEPTION_HANDLER_METHODS选出 class 中标注@ExceptionHandler的方法，解析@Exception注解的value值(class类型的数组)，并加入到当前ExceptionHandlerMethodResolver的mappedMethods集合中，key为 异常类型 ，value为 method. 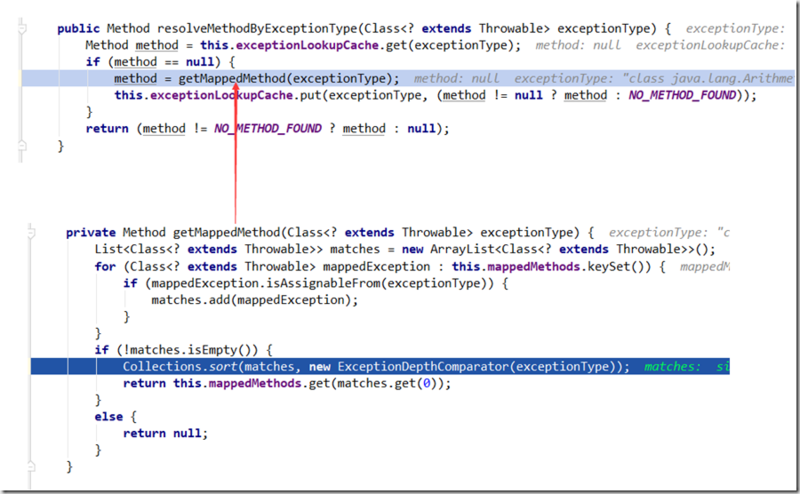 resolveMethodByExceptionType方法，尝试从缓存A：exceptionLookupCache中根据 异常class类型获取Method ，初始时候肯定缓存为空 ，就去 遍历ExceptionHandlerMethodResolver的mappedMethods(上面提及了key为异常类型，value为method), exceptionType为当前@RequestMapping方法抛出的异常，判断当前异常类型是不是@ExceptionHandler中value声明的子类或本身，满足条件就代表匹配上了；可能存在多个匹配的方法，使用ExceptionDepthComparator排序，排序规则是按照继承顺序来(继承关系越靠近数值越小，当前类最小为0,顶级父类Throwable为int最大值)，排序之后选取继承关系最靠近的那个，并且存入ExceptionHandlerMethodResolver的exceptionLookupCache中，key为当前抛出的异常，value为解析出来的匹配method. ControllerAdviceBean.findAnnotatedBeans方法查找了SpringMvc父子容器中标注 @ControllerAdvice 的bean, new ExceptionHandlerMethodResolver初始化时候解析了当前的@ControllerAdvice的bean的@ExceptionHandler,加入到ExceptionHandlerExceptionResolver的exceptionHandlerAdviceCache中，key为ControllerAdviceBean，value为ExceptionHandlerMethodResolver . 到这里exceptionHandlerAdviceCache就初始化完毕.